I first encountered this image in the Netflix documentary “Evolution of Hip Hop”. In this picture you see, San Francisco-based rapper Paris re-create the famous wicker chair photo the of Black Panthers co-founder Huey Newton. This image is downloaded from sfchronicle.com. This specific image is a leitmotif in the video for “Hard Truth Soldier (redux)”, found on guerillafunk.com. This song is from the 2015 album Pistol Politics. 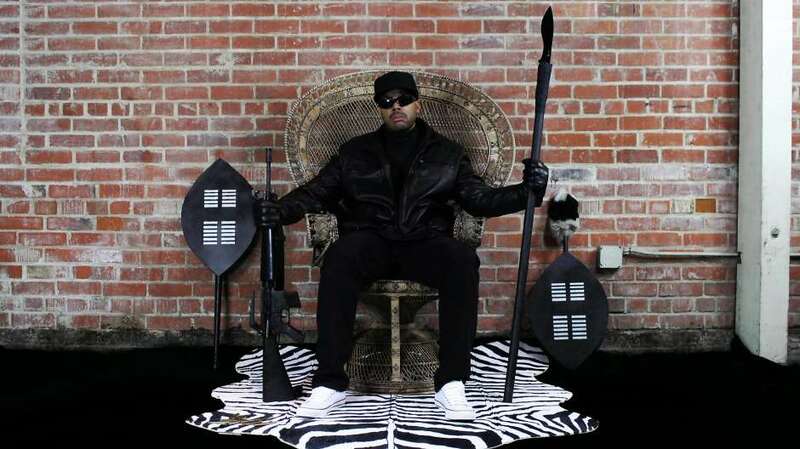 In this video Paris is performing his rap from the wicker chair, alongside historical and iconic imagery of the Black Panther Movement, the civil rights struggle, the Black Lives Matter protests, black heroes and hiphop-icons. Oscar Jackson, Jr. (born October 29, 1967), better known by his stage name Paris, is an American rapper from San Francisco, California, known for his highly charged political and socially conscious lyrics. Found in sfchronicle.com, photo by: Guerrilla Funk.